I bought this adorable Miu Miu handbag last year September in Barcelona. The Miu Miu store in the Catalan capital had just opened its doors and I fell in love with it. From the interior decoration to the shoes, bags, clothes and sales assistants, everything was perfect at the Miu Miu store. My heart was beating fast that day at the sight of so much beauty. I fell in love with several items, but one of them I could not leave the store without! It was this gorgeous Bow Satchel in pastel pink that I have owned for a year now. As pretty as it still is, after a year the leather has become dry and the color is starting to fade away. I'm still deeply in love with it and is my top choice among all of my bags, but I'm starting to think whether it's time for a new Miu Miu... I'm considering owning the big-sized bow satchel in another color, should I go for it or try other styles/brands instead? Well I have the big sized bow satchel in red and I wore it once or twice on my blog. I can only encourage you to buy it, if you like large bags. On mytheresa.com, they have lots of different models of Miu Miu bags, maybe you should check it out. Great choice! That pink I feel can transcend almost any season with the right outfit. I would say anothe brand. But I like its look none the less! 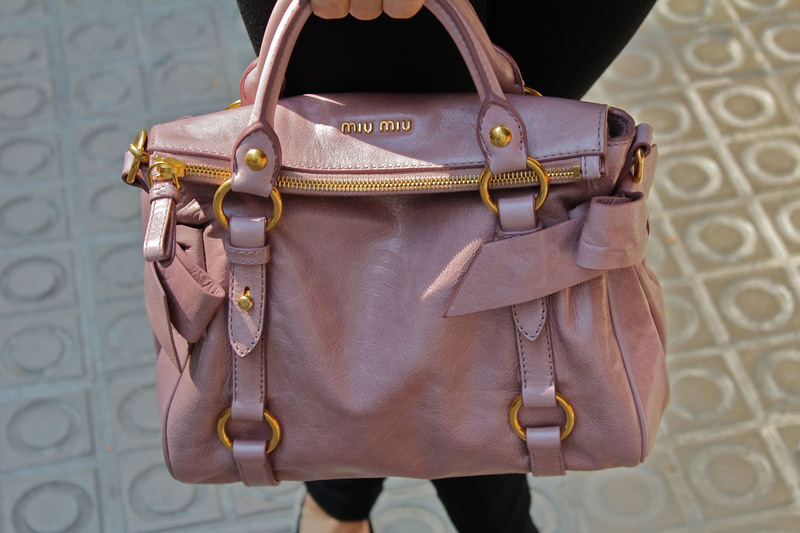 I love you Miu Miu bag, I have one that I love too! You look amazing, New fan right here! Un bolso pensat per tu! Maca maquissima! I love the top in those first pics!!! SO lovely! You have such a classy style! I am your newest follower. That bag is delicious. I want one! omg the bag is to die for! I love it! I love your style! This bag seems to be made for you!